Benson, J. H., Bryant, C., Crabtree, P, Diemer, E. L., Gimbel, A., Goldberg, W. B., . . . Womack, D. R. (2004). 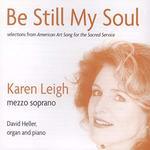 Be still my soul: Selections from American Art Song for the Sacred Service [Recorded by K. Leigh & D. Heller; CD]. American Composers Alliance.